If you look up the British Board of Film Classification in The Encylopedia of British Film, you are given a cross-reference to ‘censorship’. That’s a little hard, indeed misleading for an organisation which since 1985 has had the C in its initials standing for Classification rather than Censorship. They do not censor films as such (though some cuts are made where films infringe guidelines or actually break the laws of the land), they rate films according to social expectations. Those expectations are reflected in guidelines which have changed down the years as society and society’s relationship to the screen have changed. To follow the BBFC’s journey from censorship to classification is to understand how much films are profoundly connected to the temper of their times. 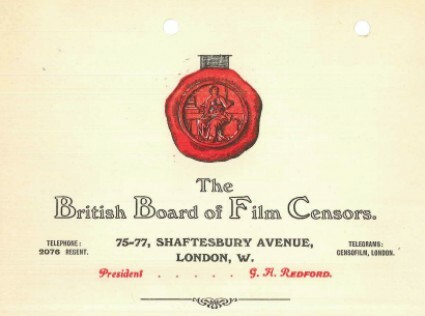 The British Board of Film Censors was formed one hundred years ago in 1912. Ever since motion pictures first appeared in Britain, the authorities sought to control them, though primarily they were concerned with how and where films were shown rather than what they showed. Tragic deaths at Newmarket in 1907 (where two woman and a girl died in a film fire) and Barnsley in 1908 (when sixteen children were crushed to death at crowded cinematograph show) demonstrated that film shows had to be brought under local authority control, though equally there was concern at the young, the mixed sexes and the working class being brought together in the dark where you couldn’t keep a proper eye on them. The fire risk was real, but it was also an excuse for the exercise of moral censure. Existing legislation did not cover cinema shows, so in 1909 the Cinematograph Act was passed, which required cinemas to be licensed. Now attention turned to the films themselves. There was considerable social disquiet at the content of some films, particularly as a large part of the cinema audience consisted of children. Films were accused of encouraging children to steal, of corrupting morals, of transgressing the bonds of society. 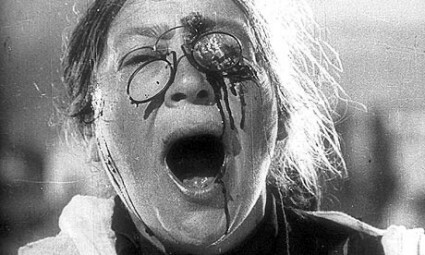 There were calls for government censorship, and local authorities started to censor films for themselves, applying widely different standards. It was to bring about uniformity of decisions nationally, and to avoid the perils of state-imposed censorship, that the British film industry decide to police itself. So in November the British Board of Film Censors was formed, head by George Redford. The Secretary was J. Brooke Wilkinson, and there were four examiners. Every film to be screened in Britain had to be passed by the BBFC, though it had no statutory authority, those powers remaining with the local councils (who also administrated cinema licences) and who could override the BBFC’s decisions if they so chose. Topicals, or newsreels as they were to become, were made exempt from censorship (except in wartime). Film companies had to pay for films to be registered, which funded the service (and does to this day). The BBFC began work on 1 January 1913, and there were two categories of certificate that it could assign to a film: U, for Universal exhibition, and A, for Adult only. Some films were subject to cuts; others were rejected entirely. In its first year of operation the BBFC examined 7,488 films, passed 6,681 as U, 627 as A, took exception to 166, and completely rejected 22 (figures from Rachael Low, The History of the British Film 1906-1914). The film is so cryptic as to be almost meaningless. If there is a meaning, it is doubtless objectionable. which stands as one of the most memorable lines of film criticism ever written. This reputation is not entirely fair. The BBFC took its work seriously, and when it took upon itself not to allow films that could be ‘calculated to demoralise an audience … or undermine the teachings of morality’ then it only did so after careful consideration of each film, measured against what it sensed to be the prevailing feeling of society. The problem was that the society familiar to the BBFC’s examiners in the 1920s was a narrow one, constrained by class and social prejudice. They tried to dictate the behaviour of society at large by muffling the films that people wanted to see, but banning the film did not halt the public taste for what it showed, nor did it halt the vice from happening in real life. The BBFC thought it was protecting society, but really it was protecting itself from that society – and it was fighting a losing battle. Various decisions made by the BBFC in the 1920s have become renowned for what they reveal of the governing class’s fears and assumptions. Damaged Goods (1919), a coy drama about the dangers of venereal disease, was rejected outright (despite appeals from some authorities to allow screenings beause of the lessons the film made) as much because it was propagandist in tone as because of its subject matter. The same producer, Samuelson’s, subsequently submitted Married Love (1923), scripted by family planning pioneer Marie Stopes, which decorously approached the subject of birth control. This was passed with cuts once its propagandist tone had been cut down, Marie Stopes’ name had been removed, and the title was changed to Maisie’s Marriage. 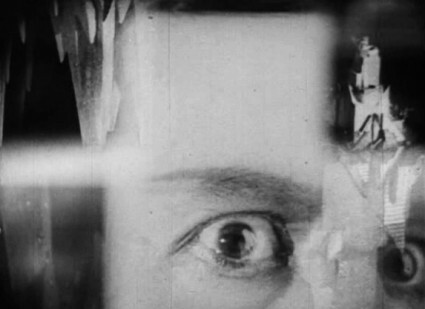 On the subject of drugs, the BBFC rejected Mrs Wallace Reid’s impassioned Human Wreckage (1923), not wishing to countenance any film on the theme of drug addiction, yet it passed Graham Cutts’ Cocaine (1922), once its sensational title had been changed to While London Sleeps and after the producer Herbert Wilcox had defied the BBFC by securing screenings of the film in Manchester. Another Wilcox production, the ponderous Dawn (1928), on Nurse Edith Cavell (executed by the Germans during the war for helping Allied soldiers escape), which was denied a certificate because it might revive anti-German feeling. Political pressure was probably exercised, but many local authorities passed the film for screening anyway, demonstrating how the BBFC’s rulings were, after all, only guidelines. No doubt at the back of the BBFC’s mind was the nine day British general strike in May 1926 which had provoked fears amongst some quarters of society of a potential revolution in the UK. It was claimed that the violence scenes in the film were further reason for its rejection, but no cuts were ordered for these, making its unwelcome political theme the real reason why it was refused a certificate, though it was shown in its uncertificated state at the London Film Society (it was eventually passed by the BBFC in 1954, with a X certificate). Another example of a film screened in Britain despite hot having been passed by the BBFC was Auction of Souls. This semi-drama semi-documentary told of the Armenian genocide as experienced by escapee Aurora Mardiganian. It featured scenes of massacres, tortures, brutalities of every description, culminating in an horrific scene of a row of crucified naked women. It is hard to imagine such a film being made, still less being offered as a commercial proposition, yet it had been widely shown in America where it was produced. The film was shown at the Albert Hall in London by the League of Nations Union, before the BBFC had viewed it, and when the distributor refused to countenance any cuts the BBFC said it was inevitable that the film would be rejected (though it never actually reviewed the film formally). It was not just the shocking scenes but a fear expressed through the Foreign Office that the film could endanger ongoing peace talks with Turkey that influenced their thinking. Subsequently a London cinema showed it in defiance of its local authority which said that all films shown in its district needed a BBFC certificate. The cinema won the ensuing court case, but in the end the Home Office instituted a system whereby almost all local authorities agreed not to permit the screening of any film rejected by the BBFC. This decision helped cement the position of the BBFC at the heart of British film exhibition, a place that it retains to this day. Many have mocked the BBFC of the 1920s, seeing it as an out-of-touch institution peopled by retired colonels and maiden aunts gently bent on maintaining the values of a past age which had probably never existed in the first place. The BBFC was unduly concerned by contentious moral issues, it did display political bias, and though ostensibly independent it did bow to political pressure from the Home Office. But it could also be argued as having helped save the British film business, carefully managing the conflicting interests of distributors, audiences and society’s guardians, in a manner that helped establish the cinema as an accepted feature of British life rather than the threat that many felt it represented back in 1912. The British Board of Film Classification, as it now is, rarely rejects films outright these days. It demands cuts, certainly, measured against a regularly reviewed set of guidelines, but it seldom bans outright, despite films of a nature that would make Messrs Redford or O’Connor faint dead away with shock. It has to maintain a balance between those who abhor being told what they can or cannot see and protest at any cuts and those revolted or upset by cinema’s latest extremes and who call for such films to be banned. Striking a balance has always been at the heart of the BBFC’s work, even if the organisation of today is predicated on a trust in the audience’s good judgment that the BBFC of earlier decades was not. The BBFC’s website is well worth visting. It has a history of the organisation, explanation of its guidelines, statistics, the law, and information on recent decisions. There are supplementary websites for parents, schools, and students of media regulation and film. Above all there is its database – a listing of films or videos that the BBFC has examined. Using the Advanced Search option with the date delimiters, the database turns out to have 4,590 titles for the silent era (1912-1929). This cannot be anywhere near the number of films that were actually examined by the BBFC for the period, but it is a rich resource nonetheless. The records are a little on the spartan side. Mostly you get title, date submitted, distributor (i.e. the company that submitted the film for examination), length of cuts made (but no details of wat the cuts were or why they were made) and three categories – U, A or R for Rejected. Refining the search to Rejected titles only brings up 208 results. It is fascinating mixture of the familiar and the little known, identification of which is sometimes difficult because English titles are given for what were often foreign releases. But because this post has gone on long enough, further analysis of the 208 rejectees will have to be the subject of a follow-up post. The BBFC is marking its centenary in a number of ways. There is a centenary section of the site, which includes outlines various celebratory activities taking place and has an archive section looking back at past highlights and items of interest. Post number one in the archive contains a downloadable facsimile of a 1912 pamphlet introducing the BBFC to exhibitors and promising “absolutely independent and impartial censorship”. There is to be a film season at the BFI Southbank marking the centenary later in the year, and a book marking “100 years of film classification” (they don’t say censorship) will be published in the Autumn. This is going to be particularly welcome, since it’s been a while since we had a good book published on British film censorship (or classification). If you do want to read more, a good place to start is James C. Robertson’s The British Board of Film Censors: Film Censorship in Britain 1896-1950 (1985) and The Hidden Cinema: British Film Censorship in Action, 1913-1972 (1989). For those interested in the legal side, Neville March Hunnings’ Film Censors and the Law (1967) is an exceptional work, exhaustive and illuminating, covering not only Britain but the history of film censorships in the USA, India, Canada, Australia, Denmark, France and the USSR. Also recommended is Annette Kuhn’s sophisticatedly argued Cinema, Censorship and Sexuality 1909-1925 (1988) and Picture Palace: A Social History of the Cinema (1974), written by Audrey Field, a BBFC examiner, who reveals that comonsense and a sympathetic understanding of people were hallmarks of at least some at the BBFC far earlier than many might suspect. Update: A follow-up post identifying the 208 films rejected by the BBFC during the silent era is at https://thebioscope.net/2012/03/22/the-rejected.